As a QRPer I'm not a huge fan of contests but I do participate in some of them mainly to fill up my log and if possible to work a new DXCC. One of the contests I enjoy most is the Scandinavian Activity Contest. 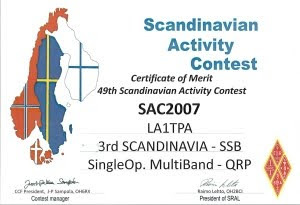 Here the other day I received an award showing that I got the 3rd place in Scandinavia - SSB, Single OP, Multiband - QRP. In 2007! And I received the 2008 award over a month ago! Norway, Sweden, Finland and Denmark are taking turns hosting the contest. The Swedes were hosting in 2008 and managed to send me the award after 11 months while the Norwegians used over two years to do the same thing for the contest held in 2007. I'm not complaining because I know these things are done by people who are doing this on their own spare time.